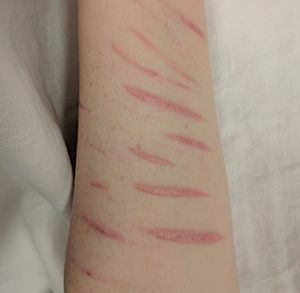 Healed scars on the forearm from prior self harm. The desire to self-harm is a common symptom of some personality disorders. People with other mental disorders may also self-harm, including those with depression, anxiety disorders, substance abuse, eating disorders, post-traumatic stress disorder, schizophrenia, and dissociative disorders. Studies also provide strong support for a self-punishment function, and modest evidence for anti-dissociation, interpersonal-influence, anti-suicide, sensation-seeking, and interpersonal boundaries functions. . Self-harm can also occur in high-functioning individuals who have no underlying mental health diagnosis. The motivations for self-harm vary. Some use it as a coping mechanism to provide temporary relief of intense feelings such as anxiety, depression, stress, emotional numbness, or a sense of failure. Self-harm is often associated with a history of trauma, including emotional and sexual abuse. There are a number of different methods that can be used to treat self-harm and which concentrate on either treating the underlying causes or on treating the behaviour itself. When self-harm is associated with depression, antidepressant drugs and therapy may be effective. Other approaches involve avoidance techniques, which focus on keeping the individual occupied with other activities, or replacing the act of self-harm with safer methods that do not lead to permanent damage. Self-harm (SH), also referred to as self-injury (SI), self-inflicted violence (SIV), nonsuicidal self injury (NSSI) or self-injurious behaviour (SIB), are different terms to ascribe behaviours where demonstrable injury is self-inflicted. The behaviour involves deliberate tissue damage that is usually performed without suicidal intent. The most common form of self-harm involves cutting of the skin using a sharp object, e. g. a knife or razor blade. The term self-mutilation is also sometimes used, although this phrase evokes connotations that some find worrisome, inaccurate, or offensive. Self-inflicted wounds is a specific term associated with soldiers to describe non-lethal injuries inflicted in order to obtain early dismissal from combat. This differs from the common definition of self-harm, as damage is inflicted for a specific secondary purpose. A broader definition of self-harm might also include those who inflict harm on their bodies by means of disordered eating. The older literature has used several different terms. For this reason research in the past decades has inconsistently focused on self-harming behavior without and with suicidal intent (including suicide attempts) with varying definitions leading to inconsistent and unclear results. Nonsuicidal self-injury (NSSI) has been listed as a proposed disorder in the DSM-5 under the category "Conditions for Further Study". It is noted that this proposal of diagnostic criteria for a future diagnosis is not an officially approved diagnosis and may not be used for clinical use but is meant for research purposes only. The disorder is defined as intentional self-inflicted injury without the intent of committing suicide. Criteria for NSSI include five or more days of self-inflicted harm over the course of one year without suicidal intent, and the individual must have been motivated by seeking relief from a negative state, resolving an interpersonal difficulty, or achieving a positive state. A common belief regarding self-harm is that it is an attention-seeking behaviour; however, in many cases, this is inaccurate. Many self-harmers are very self-conscious of their wounds and scars and feel guilty about their behaviour, leading them to go to great lengths to conceal their behaviour from others. They may offer alternative explanations for their injuries, or conceal their scars with clothing. Self-harm in such individuals may not be associated with suicidal or para-suicidal behaviour. People who self-harm are not usually seeking to end their own life; it has been suggested instead that they are using self-harm as a coping mechanism to relieve emotional pain or discomfort or as an attempt to communicate distress. Alternatively, interpretations based on the supposed lethality of a self-harm may not give clear indications as to its intent: seemingly superficial cuts may have been a suicide attempt, whereas life-threatening damage may have been done without the intent to die. Studies of individuals with developmental disabilities (such as intellectual disability) have shown self-harm being dependent on environmental factors such as obtaining attention or escape from demands. Some individuals may have dissociation harboring a desire to feel real or to fit into society's rules. Eighty percent of self-harm involves stabbing or cutting the skin with a sharp object. However, the number of self-harm methods are only limited by an individual's inventiveness and their determination to harm themselves; this includes burning, self-poisoning, alcohol abuse, self-embedding of objects, hair pulling, bruising/hitting one's self, scratching to hurt one's self, knowingly abusing over the counter or prescription drugs, and forms of self-harm related to anorexia and bulimia. The locations of self-harm are often areas of the body that are easily hidden and concealed from the detection of others. As well as defining self-harm in terms of the act of damaging the body, it may be more accurate to define self-harm in terms of the intent, and the emotional distress that the person is attempting to deal with. Neither the DSM-IV-TR nor the ICD-10 provide diagnostic criteria for self-harm. It is often seen as only a symptom of an underlying disorder, though many people who self-harm would like this to be addressed. Common signs that a person may be engaging in self-harm include the following: they ensure that there are always harmful objects close by, they are experiencing difficulties in their personal relationships, their behaviour becomes unpredictable, they question their worth and identity, they make statements that display helplessness and hopelessness. Although some people who self-harm do not have any form of recognised mental disorder, many people experiencing various forms of mental illnesses do have a higher risk of self-harm. The key areas of disorder which exhibit an increased risk include autism spectrum disorders, borderline personality disorder, Dissociative disorders bipolar disorder, depression, phobias, and conduct disorders. Schizophrenia may also be a contributing factor for self-harm. Those diagnosed with schizophrenia have a high risk of suicide, which is particularly greater in younger patients as they may not have an insight into the serious effects that the disorder can have on their lives. Substance abuse is also considered a risk factor as are some personal characteristics such as poor problem-solving skills and impulsivity. There are parallels between self-harm and Münchausen syndrome, a psychiatric disorder in which individuals feign illness or trauma. There may be a common ground of inner distress culminating in self-directed harm in a Münchausen patient. However, a desire to deceive medical personnel in order to gain treatment and attention is more important in Münchausen's than in self-harm. Abuse during childhood is accepted as a primary social factor increasing the incidence of self-harm, as is bereavement, and troubled parental or partner relationships. Factors such as war, poverty, and unemployment may also contribute. Other predictors of self-harm and suicidal behavior include feelings of entrapment, defeat, lack of belonging, and perceiving oneself as a burden along with less effective social problem-solving skills. Self-harm is frequently described as an experience of depersonalisation or a dissociative state. As many as 70% of individuals with borderline personality disorder engage in self-harm. An estimated 30% of individuals with autism spectrum disorders engage in self-harm at some point, including eye-poking, skin-picking, hand-biting, and head-banging. The onset of puberty has also been shown to be the onset of self-harm including the onset of sexual activity; this is because the pubertal period is a period of neurodevelopmental vulnerability and comes with an increased risk of emotional disorders and risk-taking behaviors. The most distinctive characteristic of the rare genetic condition, Lesch–Nyhan syndrome, is self-harm and may include biting and head-banging. Genetics may contribute to the risk of developing other psychological conditions, such as anxiety or depression, which could in turn lead to self-harming behaviour. However, the link between genetics and self-harm in otherwise healthy patients is largely inconclusive. Substance misuse, dependence and withdrawal are associated with self-harm. Benzodiazepine dependence as well as benzodiazepine withdrawal is associated with self-harming behaviour in young people. Alcohol is a major risk factor for self-harm. A study which analysed self-harm presentations to emergency rooms in Northern Ireland found that alcohol was a major contributing factor and involved in 63.8% of self-harm presentations. A recent study in the relation between cannabis use and deliberate self-harm (DSH) in Norway and England found that, in general, cannabis use may not be a specific risk factor for DSH in young adolescents. Smoking has also been associated with self-harm in adolescents; one study found that suicide attempts were four times higher for adolescents that smoke than for those that do not. Self-harm is not typically suicidal behaviour, although there is the possibility that a self-inflicted injury may result in life-threatening damage. Although the person may not recognise the connection, self-harm often becomes a response to profound and overwhelming emotional pain that cannot be resolved in a more functional way. The motivations for self-harm vary, as it may be used to fulfill a number of different functions. These functions include self-harm being used as a coping mechanism which provides temporary relief of intense feelings such as anxiety, depression, stress, emotional numbness and a sense of failure or self-loathing. There is also a positive statistical correlation between self-harm and emotional abuse. Self-harm may become a means of managing and controlling pain, in contrast to the pain experienced earlier in the person's life of which they had no control over (e.g., through abuse). Other motives for self-harm do not fit into medicalised models of behaviour and may seem incomprehensible to others, as demonstrated by this quotation: "My motivations for self-harming were diverse, but included examining the interior of my arms for hydraulic lines. This may sound strange." Assessment of motives in a medical setting is usually based on precursors to the incident, circumstances, and information from the patient. However, limited studies show that professional assessments tend to suggest more manipulative or punitive motives than personal assessments. The UK ONS study reported only two motives: "to draw attention" and "because of anger". For some people, harming themselves can be a means of drawing attention to the need for help and to ask for assistance in an indirect way. It may also be an attempt to affect others and to manipulate them in some way emotionally. However, those with chronic, repetitive self-harm often do not want attention and hide their scars carefully. Many people who self-harm state that it allows them to "go away" or dissociate, separating the mind from feelings that are causing anguish. This may be achieved by tricking the mind into believing that the present suffering being felt is caused by the self-harm instead of the issues they were facing previously: the physical pain therefore acts as a distraction from the original emotional pain. To complement this theory, one can consider the need to "stop" feeling emotional pain and mental agitation. "A person may be hyper-sensitive and overwhelmed; a great many thoughts may be revolving within their mind, and they may either become triggered or could make a decision to stop the overwhelming feelings." Alternatively, self-harm may be a means of feeling something, even if the sensation is unpleasant and painful. Those who self-harm sometimes describe feelings of emptiness or numbness (anhedonia), and physical pain may be a relief from these feelings. "A person may be detached from themselves, detached from life, numb and unfeeling. They may then recognise the need to function more, or have a desire to feel real again, and a decision is made to create sensation and 'wake up'." Those who engage in self-harm face the contradictory reality of harming themselves while at the same time obtaining relief from this act. It may even be hard for some to actually initiate cutting, but they often do because they know the relief that will follow. For some self-harmers this relief is primarily psychological while for others this feeling of relief comes from the beta endorphins released in the brain. Endorphins are endogenous opioids that are released in response to physical injury, acting as natural painkillers and inducing pleasant feelings, and in response to self-harm would act to reduce tension and emotional distress. Many self-harmers report feeling very little to no pain while self-harming and, for some, deliberate self-harm may become a means of seeking pleasure. As a coping mechanism, self-harm can become psychologically addictive because, to the self-harmer, it works; it enables them to deal with intense stress in the current moment. The patterns sometimes created by it, such as specific time intervals between acts of self-harm, can also create a behavioural pattern that can result in a wanting or craving to fulfill thoughts of self-harm. Emotional pain activates the same regions of the brain as physical pain, so emotional stress can be a significantly intolerable state for some people. Some of this is environmental and some of this is due to physiological differences in responding. The autonomic nervous system is composed of two components: the sympathetic nervous system controls arousal and physical activation (e.g., the fight-or-flight response) and the parasympathetic nervous system controls physical processes that are automatic (e.g., saliva production). The sympathetic nervous system innervates (e.g., is physically connected to and regulates) many parts of the body involved in stress responses. Studies of adolescents have shown that adolescents who self-injure have greater physiological reactivity (e.g., skin conductance) to stress than adolescents who do not self-injure. This stress response persists over time, staying constant or even increasing in self-injuring adolescents, but gradually decreases in adolescents who do not self-injure. There is considerable uncertainty about which forms of psychosocial and physical treatments of people who harm themselves are most effective. Psychiatric and personality disorders are common in individuals who self-harm and as a result self-harm may be an indicator of depression and/or other psychological problems. Many people who self-harm have moderate or severe depression and therefore treatment with antidepressant medications may often be used. There is tentative evidence for the medication flupentixol; however, greater study is required before it can be recommended. There is no well-established treatment for self-injurious behaviour in children or adolescents. Cognitive behavioural therapy may also be used to assist those with Axis I diagnoses, such as depression, schizophrenia, and bipolar disorder. Dialectical behaviour therapy (DBT) can be successful for those individuals exhibiting a personality disorder, and could potentially be used for those with other mental disorders who exhibit self-harming behaviour. Diagnosis and treatment of the causes of self-harm is thought by many to be the best approach to treating self-harm. But in some cases, particularly in people with a personality disorder, this is not very effective, so more clinicians are starting to take a DBT approach in order to reduce the behaviour itself. People who rely on habitual self-harm are sometimes hospitalised, based on their stability, their ability and especially their willingness to get help. In adolescents multisystem therapy shows promise. Treatments such as CBT, family intervention, interpersonal therapy, and various psychodynamic therapies were all shown to be possibly effective in treating self-injurious behaviour in children and adolescents. Pharmacotherapy has not been tested as a treatment for adolescents who self-harmed. A meta-analysis found that psychological therapy is effective in reducing self-harm. The proportion of the adolescents who self-harmed over the follow-up period was lower in the intervention groups (28%) than in controls (33%). Psychological therapies with the largest effect sizes were dialectical behaviour therapy (DBT), cognitive-behavioural therapy (CBT), and mentalization-based therapy (MBT). In individuals with developmental disabilities, occurrence of self-harm is often demonstrated to be related to its effects on the environment, such as obtaining attention or desired materials or escaping demands. As developmentally disabled individuals often have communication or social deficits, self-harm may be their way of obtaining these things which they are otherwise unable to obtain in a socially appropriate way (such as by asking). One approach for treating self-harm thus is to teach an alternative, appropriate response which obtains the same result as the self-harm. Generating alternative behaviours that the person can engage in instead of self-harm is one successful behavioural method that is employed to avoid self-harm. Techniques, aimed at keeping busy, may include journaling, taking a walk, participating in sports or exercise or being around friends when the person has the urge to harm themselves. The removal of objects used for self-harm from easy reach is also helpful for resisting self-harming urges. The provision of a card that allows the person to make emergency contact with counselling services should the urge to self-harm arise may also help prevent the act of self-harm. Alternative and safer methods of self-harm that do not lead to permanent damage, for example the snapping of a rubber band on the wrist, may also help calm the urge to self-harm. [not in citation given] Using biofeedback may help raise self-awareness of certain pre-occupations or particular mental state or mood that precede bouts of self-harming behaviour, and help identify techniques to avoid those pre-occupations before they lead to self-harm. Any avoidance or coping strategy must be appropriate to the individual's motivation and reason for harming. World-map showing the disability-adjusted life year, which is a measure of each country's disease burden, for self-inflicted injuries per 100,000 inhabitants in 2004. It is difficult to gain an accurate picture of incidence and prevalence of self-harm. This is due in a part to a lack of sufficient numbers of dedicated research centres to provide a continuous monitoring system. However, even with sufficient resources, statistical estimates are crude since most incidences of self-harm are undisclosed to the medical profession as acts of self-harm are frequently carried out in secret, and wounds may be superficial and easily treated by the individual. Recorded figures can be based on three sources: psychiatric samples, hospital admissions and general population surveys. The World Health Organization estimates that, as of 2010, 880,000 deaths occur as a result of self-harm. About 10% of admissions to medical wards in the UK are as a result of self-harm, the majority of which are drug overdoses. However, studies based only on hospital admissions may hide the larger group of self-harmers who do not need or seek hospital treatment for their injuries, instead treating themselves. Many adolescents who present to general hospitals with deliberate self-harm report previous episodes for which they did not receive medical attention. In the United States up to 4% of adults self-harm with approximately 1% of the population engaging in chronic or severe self-harm. Current research suggests that the rates of self-harm are much higher among young people with the average age of onset between 14 and 24. The earliest reported incidents of self-harm are in children between 5 and 7 years old. In the UK in 2008 rates of self-harm in young people could be as high as 33%. In addition there appears to be an increased risk of self-harm in college students than among the general population. In a study of undergraduate students in the US, 9.8% of the students surveyed indicated that they had purposefully cut or burned themselves on at least one occasion in the past. When the definition of self-harm was expanded to include head-banging, scratching oneself, and hitting oneself along with cutting and burning, 32% of the sample said they had done this. In Ireland, a study found that instances of hospital-treated self-harm were much higher in city and urban districts, than in rural settings. The CASE (Child & Adolescent Self-harm in Europe) study suggests that the life-time risk of self-injury is ~1:7 for women and ~1:25 for men. In general, the latest aggregated research has found no difference in the prevalence of self-harm between men and women. This is in contrast to past research which indicated that up to four times as many females as males have direct experience of self-harm. However, caution is needed in seeing self-harm as a greater problem for females, since males may engage in different forms of self-harm (e.g., hitting themselves) which could be easier to hide or explained as the result of different circumstances. Hence, there remain widely opposing views as to whether the gender paradox is a real phenomenon, or merely the artifact of bias in data collection. The WHO/EURO Multicentre Study of Suicide, established in 1989, demonstrated that, for each age group, the female rate of self-harm exceeded that of the males, with the highest rate among females in the 13–24 age group and the highest rate among males in the 12–34 age group. However, this discrepancy has been known to vary significantly depending upon population and methodological criteria, consistent with wide-ranging uncertainties in gathering and interpreting data regarding rates of self-harm in general. Such problems have sometimes been the focus of criticism in the context of broader psychosocial interpretation. For example, feminist author Barbara Brickman has speculated that reported gender differences in rates of self-harm are due to deliberate socially biased methodological and sampling errors, directly blaming medical discourse for pathologising the female. This gender discrepancy is often distorted in specific populations where rates of self-harm are inordinately high, which may have implications on the significance and interpretation of psychosocial factors other than gender. A study in 2003 found an extremely high prevalence of self-harm among 428 homeless and runaway youths (aged 16–19) with 72% of males and 66% of females reporting a history of self-harm. However, in 2008, a study of young people and self-harm saw the gender gap widen in the opposite direction, with 32% of young females, and 22% of young males admitting to self-harm. Studies also indicate that males who self-harm may also be at a greater risk of completing suicide. There does not appear to be a difference in motivation for self-harm in adolescent males and females. For example, for both genders there is an incremental increase in deliberate self-harm associated with an increase in consumption of cigarettes, drugs and alcohol. Triggering factors such as low self-esteem and having friends and family members who self-harm are also common between both males and females. One limited study found that, among those young individuals who do self-harm, both genders are just as equally likely to use the method of skin-cutting. However, females who self-cut are more likely than males to explain their self-harm episode by saying that they had wanted to punish themselves. In New Zealand, more females are hospitalised for intentional self-harm than males. Females more commonly choose methods such as self-poisoning that generally are not fatal, but still serious enough to require hospitalisation. In a study of a district general hospital in the UK, 5.4% of all the hospital's self-harm cases were aged over 65. The male to female ratio was 2:3 although the self-harm rates for males and females over 65 in the local population were identical. Over 90% had depressive conditions, and 63% had significant physical illness. Under 10% of the patients gave a history of earlier self-harm, while both the repetition and suicide rates were very low, which could be explained by the absence of factors known to be associated with repetition, such as personality disorder and alcohol abuse. However, NICE Guidance on Self-harm in the UK suggests that older people who self-harm are at a greater risk of completing suicide, with 1 in 5 older people who self-harm going on to end their life. A study completed in Ireland showed that older Irish adults have high rates of deliberate self-harm, but comparatively low rates of suicide. Only recently have attempts to improve health in the developing world concentrated on not only physical illness but also mental health. Deliberate self-harm is common in the developing world. Research into self-harm in the developing world is however still very limited although an important case study is that of Sri Lanka, which is a country exhibiting a high incidence of suicide and self-poisoning with agricultural pesticides or natural poisons. Many people admitted for deliberate self-poisoning during a study by Eddleston et al. were young and few expressed a desire to die, but death was relatively common in the young in these cases. The improvement of medical management of acute poisoning in the developing world is poor and improvements are required in order to reduce mortality. Deliberate self-harm is especially prevalent in prison populations. A proposed explanation for this is that prisons are often violent places, and prisoners who wish to avoid physical confrontations may resort to self-harm as a ruse, either to convince other prisoners that they are dangerously insane and resilient to pain or to obtain protection from the prison authorities. Self-harm also occurs frequently in inmates who are placed in solitary confinement. Self-harm was, and in some cases continues to be, a ritual practice in many cultures and religions. The Maya priesthood performed auto-sacrifice by cutting and piercing their bodies in order to draw blood. A reference to the priests of Baal "cutting themselves with blades until blood flowed" can be found in the Hebrew Bible. However, in Judaism, such self-harm is forbidden under Mosaic law. It occurred in ancient Canaanite mourning rituals, as described in the Ras Shamra tablets. Self-harm is practised in Hinduism by the ascetics known as sadhus. In Catholicism it is known as mortification of the flesh. Some branches of Islam mark the Day of Ashura, the commemoration of the martyrdom of Imam Hussein, with a ritual of self-flagellation, using chains and swords. Dueling scars such as those acquired through academic fencing at certain traditional German universities are an early example of scarification in European society. Sometimes, students who did not fence would scar themselves with razors in imitation. Constance Lytton, a prominent suffragette, used a stint in Holloway Prison during March 1909 to mutilate her body. Her plan was to carve 'Votes for Women' from her breast to her cheek, so that it would always be visible. But after completing the "V" on her breast and ribs she requested sterile dressings to avoid blood poisoning, and her plan was aborted by the authorities. She wrote of this in her memoir Prisons and Prisoners. Kikuyu girls cut each other's vulvas in the 1950s as a symbol of defiance, in the context of the campaign against female genital mutilation in colonial Kenya. The movement came to be known as Ngaitana ("I will circumcise myself"), because to avoid naming their friends the girls said they had cut themselves. Historian Lynn Thomas described the episode as significant in the history of FGM because it made clear that its victims were also its perpetrators. neurotic – nail-biters, pickers, extreme hair removal and unnecessary cosmetic surgery. 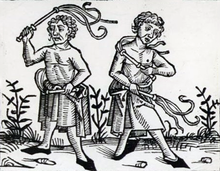 religious – self-flagellants and others. puberty rites – hymen removal, circumcision or clitoral alteration. organic brain diseases – which allow repetitive head-banging, hand-biting, finger-fracturing or eye removal. conventional – nail-clipping, trimming of hair and shaving beards. Pao (1969) differentiated between delicate (low lethality) and coarse (high lethality) self-mutilators who cut. The "delicate" cutters were young, multiple episodic of superficial cuts and generally had borderline personality disorder diagnosis. The "coarse" cutters were older and generally psychotic. Ross and McKay (1979) categorized self-mutilators into 9 groups: cutting, biting, abrading, severing, inserting, burning, ingesting or inhaling and hitting and constricting. After the 1970s the focus of self-harm shifted from Freudian psycho-sexual drives of the patients. Walsh and Rosen (1988) created four categories numbered by Roman numerals I–IV, defining Self-mutilation as rows II, III and IV. Favazza and Rosenthal (1993) reviewed hundreds of studies and divided self-mutilation into two categories: culturally sanctioned self-mutilation and deviant self-mutilation. Favazza also created two subcategories of sanctioned self-mutilations; rituals and practices. The rituals are mutilations repeated generationally and "reflect the traditions, symbolism, and beliefs of a society" (p. 226). Practices are historically transient and cosmetic such as piercing of earlobes, nose, eyebrows as well as male circumcision (for non-Jews) while Deviant self-mutilation is equivalent to self-harm. The orange ribbon of self-harm awareness. There are many movements among the general self-harm community to make self-harm itself and treatment better known to mental health professionals, as well as the general public. For example, March 1 is designated as Self-injury Awareness Day (SIAD) around the world. On this day, some people choose to be more open about their own self-harm, and awareness organizations make special efforts to raise awareness about self-harm. Some people wear an orange awareness ribbon or wristband to encourage awareness of self-harm. Self-harm in non-human mammals is a well-established but not widely known phenomenon. Its study under zoo or laboratory conditions could lead to a better understanding of self-harm in human patients. Zoo or laboratory rearing and isolation are important factors leading to increased susceptibility to self-harm in higher mammals, e.g., macaque monkeys. Non-primate mammals are also known to mutilate themselves under laboratory conditions after administration of drugs. For example, pemoline, clonidine, amphetamine, and very high (toxic) doses of caffeine or theophylline are known to precipitate self-harm in lab animals. In dogs, canine obsessive-compulsive disorder can lead to self-inflicted injuries, for example canine lick granuloma. Captive birds are sometimes known to engage in feather-plucking, causing damage to feathers that can range from feather shredding to the removal of most or all feathers within the bird's reach, or even the mutilation of skin or muscle tissue. Breeders of show mice have noticed similar behaviours. One known as "barbering" involves a mouse obsessively grooming the whiskers and facial fur off of themselves and cage-mates. Other behaviours include scratching ears so severely that large sections are lost. ^ Groschwitz, Rebecca C.; Plener, Paul L. "The Neurobiology of Non-suicidal Self-injury (NSSI) : A review" (PDF). Suicidology Online. 3: 24–32. Retrieved 2018-03-07. ^ Davis, Jeanie Lerche. "Cutting and Self-Harm: Warning Signs and Treatment". WebMD. Retrieved 14 April 2018. ^ Mayo Clinic Staff. "Self-injury/cutting". Mayo Clinic. Mayo Foundation for Medical Education and Research (MFMER). Retrieved 14 April 2018. ^ a b c d e Hawton, Keith; Saunders, Kate; O'Connor, Rory (2012). "Self-harm and suicide in adolescents". The Lancet. 379 (9834): 2373–2382. doi:10.1016/S0140-6736(12)60322-5. PMID 22726518. ^ a b Diagnostic and Statistical Manual of Mental Disorders, 5th Edition: DSM-5. APA. May 27, 2013. p. 803. ISBN 978-0890425558. ^ Mayo Clinic Staff (2017) Self Injury/Cutting (online). Available at: https://www.mayoclinic.org/diseases-conditions/self-injury/symptoms-causes/syc-20350950 Accessed on 15 November 2017. ^ a b Johnson CP, Myers SM, Council on Children with Disabilities. Identification and evaluation of children with autism spectrum disorders. Pediatrics. 2007;120(5):1183–1215. doi:10.1542/peds.2007-2361. PMID 17967920. Lay summary: AAP, 2007-10-29. ^ a b Dominick KC, Davis NO, Lainhart J, Tager-Flusberg H, Folstein S. Atypical behaviors in children with autism and children with a history of language impairment. Res Dev Disabil. 2007;28(2):145–162. doi:10.1016/j.ridd.2006.02.003. PMID 16581226. ^ Gelder, M. et al. (2005). Psychiatry. New York: Oxford University Press. p. 171. ^ Urnes, O (Apr 30, 2009). "[Self-harm and personality disorders]". Tidsskrift for den Norske Laegeforening : Tidsskrift for Praktisk Medicin, NY Raekke. 129 (9): 872–876. doi:10.4045/tidsskr.08.0140. PMID 19415088. ^ National Treatment Agency for Substance Misuse (2007). "Drug misuse and dependence – UK guidelines on clinical management" (PDF). United Kingdom: Department of Health. Archived from the original (PDF) on 2012-10-08. ^ Rossow, I.; Hawton, K.; Ystgaard, M. (2009). "Cannabis Use and Deliberate Self-Harm in Adolescence: A Comparative Analysis of Associations in England and Norway". Archives of Suicide Research. 13 (4): 340–348. doi:10.1080/13811110903266475. PMID 19813111. ^ "Self-harm | NAMI: National Alliance on Mental Illness". www.nami.org. Retrieved 2018-10-17. ^ Hawton, K; Witt, KG; Taylor Salisbury, TL; Arensman, E; Gunnell, D; Hazell, P; Townsend, E; van Heeringen, K (6 July 2015). "Pharmacological interventions for self-harm in adults". The Cochrane Database of Systematic Reviews. 7 (7): CD011777. doi:10.1002/14651858.CD011777. PMID 26147958. ^ a b Glenn, CR; Franklin, JC; Nock, MK (2015). "Evidence-based psychosocial treatments for self-injurious thoughts and behaviors in youth". Journal of Clinical Child and Adolescent Psychology. 44 (1): 1–29. doi:10.1080/15374416.2014.945211. PMC 4557625. PMID 25256034. ^ Ougrin D, Tranah T, Leigh E, Taylor L, Asarnow JR (April 2012). "Practitioner review: Self-harm in adolescents". Journal of Child Psychology and Psychiatry, and Allied Disciplines. 53 (4): 337–50. doi:10.1111/j.1469-7610.2012.02525.x. PMID 22329807. ^ Ougrin, Dennis; Tranah, Troy; Stahl, Daniel; Moran, Paul; Asarnow, Joan Rosenbaum (2015). "Therapeutic Interventions for Suicide Attempts and Self-Harm in Adolescents: Systematic Review and Meta-Analysis". Journal of the American Academy of Child & Adolescent Psychiatry. 54 (2): 97–107. doi:10.1016/j.jaac.2014.10.009. PMID 25617250. ^ Lozano, R (Dec 15, 2012). "Global and regional mortality from 235 causes of death for 20 age groups in 1990 and 2010: a systematic analysis for the Global Burden of Disease Study 2010". Lancet. 380 (9859): 2095–2128. doi:10.1016/S0140-6736(12)61728-0. PMID 23245604. ^ a b Corcoran, P.; Reulbach, U.; Perry, I. J.; Arensman, E. (2010). "Suicide and deliberate self harm in older Irish adults". International Psychogeriatrics. 22 (8): 1327–1336. doi:10.1017/S1041610210001377. PMID 20716390. ^ Madge; et al. (2008). "Deliberate self-harm within an international community sample of young people: comparative findings from the Child & Adolescent Self-harm in Europe (CASE) Study". Journal of Child Psychology and Psychiatry. 49 (6): 667–677. doi:10.1111/j.1469-7610.2008.01879.x. ^ Kaba, Fatos; et al. (March 2014). "Solitary Confinement and Risk of Self-Harm Among Jail Inmates". American Journal of Public Health. 104 (3): 442–447. doi:10.2105/ajph.2013.301742. PMC 3953781. PMID 24521238. ^ Maimonides, Mishneh Torah, Hilchot Khovel u-Mazik ch. 5, etc. See also Damages (Jewish law). ^ a b DeMello, Margo (2007). Encyclopedia of body adornment Greenwood Publishing Group. p. 237. ISBN 978-0-313-33695-9. ^ Thomas 2000, 129–131 (131 for the girls as "central actors"); Lynn Thomas, Politics of the Womb: Women, Reproduction, and the State in Kenya, Berkeley: University of California Press, 2003, 89–91. ^ "Feather Plucking in Pet Birds". Beauty Of Birds. ^ "Feather Damaging Behavior - FDB". birdchannel.com. Archived from the original on 2008-10-22. ^ "Parrots' behaviors mirror human mental disorders". purdue.edu. ^ Kalueff, A.V. ; Minasyan, A.; Keisala, T.; Shah, Z.H. ; Tuohimaa, P. (2006). "Hair barbering in mice: Implications for neurobehavioural research". Behavioural Processes. 71 (1): 8–15. doi:10.1016/j.beproc.2005.09.004. PMID 16236465. Wikimedia Commons has media related to Self harm.